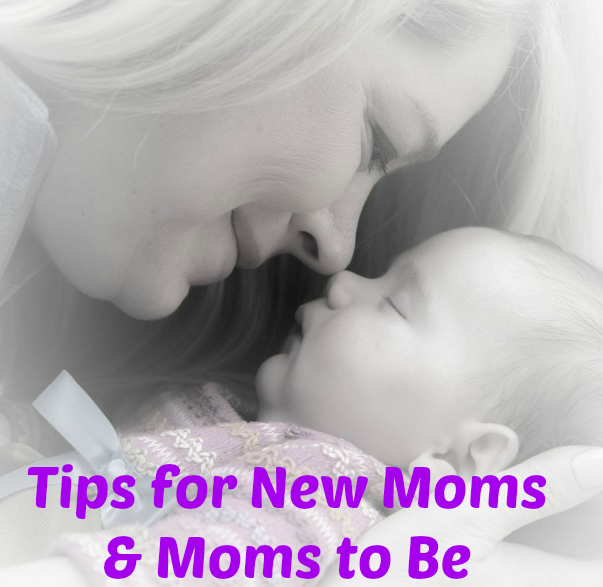 As a mom of five, I can say I’ve Been There Done That (BTDT) many times so here are my tips for new moms and moms to be. *This post contains affiliate links. If you purchase anything through these links, you will not pay more but I will receive a small amount which will go towards blog fees. Google is NOT your friend. I’m an education junkie and like many people now, I search Google for information when I don’t know something. However Google and other search engines can also cause unnecessary stress as that strange symptom you looked up can suddenly be a possible symptom to a rare but deadly illness for your or baby. All that accomplishes is to freak you out at a time when you should be keeping stress down. Ask a friend, ask your doctor, read a book, but do not look on Google. Find a Support System. Family or Friends who are also pregnant or have recently been pregnant can be a good support, or you can look for classes nearby for pregnant moms. If you are an internet junkie like me, you can find Forums and Facebook Groups full of women who are not only pregnant as well but due in the same month and year as you. This is great because you are all going through your pregnancies at the same time and are in the same stages. Write Things Down. You will want to be able to look back and remember how the pregnancy went many years later. If you are a writer, start a pregnancy journal or blog. If that’s not you, at least make sure to document “firsts” like first ultrasound, first kicks as well as funny stories or memorable moments. Don’t forget photographs too! Belly shots (one each month at least), photos of the nursery as it comes together, ultrasound photos and more. Limit Visitors The First Few Weeks. I know everyone and their son wants to see your beautiful new bundle of joy, but this is the time for the two of you and anyone else in the immediate family to bond and get to know each other, to establish feeding and sleeping routines and especially for first time moms, to practice and get better at the day to day parenting skills such as diapering, feeding or dressing the baby. Let this be a quiet reflective time. Sleep, Don’t Clean. Newborns sleep in small spurts, not long periods of time and they are demanding. Whenever baby is napping, catch a few Z’s yourself, you need to recuperate from birth and catch up on sleep from waking up throughout the night. Housework can wait. Let family and friends step in to help with the house and cooking so you can rest. Keep Baby Stuff In Other Places Too. You don’t want to get up and go to the baby’s room every time he needs a change or to sleep. Have a sleeping area and a box of baby necessities (diapers, wipes, diaper cream, change mat etc.) in your bedroom and the main living space too so you don’t have to get up to move unless it’s necessary. The Post Comments Have TONS More Tips from Other Moms! 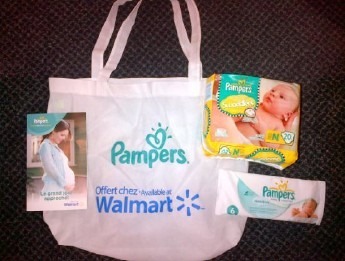 Walmart Canada and P&G teamed up in August to sponsor a series of prenatal programs in hospitals and community centres around the country to provide parents-to-be with special gift bags with Pampers products. The program reached 55,000 new moms from West to East and gave them some great tips and advice. The gift bags the moms-to-be received included a package of Pampers Swaddlers, a sample of Pampers wipes and an educational pamphlet inside a reusable gift bag.